The 501-27 bases will support a wide variety of work surfaces ranging in depth from a minimum of 18" to a maximum of 48" (Note: mounting deeper 36" - 48" work surfaces requires the installation of the 501-27 Support Extender Accessory to ensure stability.) With five model widths available, in either black or silver, these frames can accommodate tops ranging in width from 33" to over 68". The 2-leg frame is the most popular table shape for most users, and comes in widths 32 7/8" wide to 67 3/4" wide. 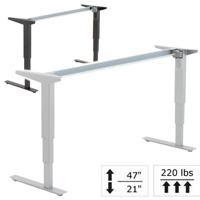 If an L-shaped workstation is preferred, select the 3-leg model (available in silver only) which has a 59 13/16" wide front and 56 7/8" wide return. Need a Tabletop? Consult our base/tabletop compatibility chart. Les piétements du 501-27 soutiennent une gamme de surfaces de travail de grande variétés avec profondeur variant de 18 po minimal à 48 po maximum. (Veuillez noter: l'assemblage des surfaces de travail plus profondes, c'est à dire, entre 36 po à 48 po, exige l'instalation de l'accessoire 501-27 Support Extender pour assurer la stabilité.) Avec des modèles de cinq largeurs différentes, argenté ou noir (l'un ou l'autre), ces piétements peuvent recevoir des dessus de tables (table tops) variants de largeur de 33 po jusqu'à plus que 68 po. Le piétement à 2-pattes est la configuration de table la plus populaire pour la majorité des usageurs, et mésure 32 7/8 po de largeur jusqu'à 67 3/4 po de largeur. Si une surface de travail qui forme un L-Shape est préférable, choisissez la modèle a 3-pattes (seulement disponible en argenté) qui a une largeur du devant de 59 13/16 po et un retour avec largeur de 56 7/8 po. 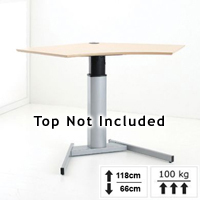 Avez vous besoin d'un dessus de table (table top)? Consultez notre graphique base/tabletop compatibility chart. The 501-37 bases support a wide variety of table tops ranging in width from 46" to over 60" and in depth from a minimum of 18" to a maximum of 30". The 501-7 Series from Conset is the most cost effective electric workstation solution in the industry today. 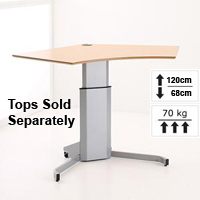 It is ideal for corner applications and will accommodate smaller tabletops with a total lift capacity of 154 lbs. The adjustment range is 26" to 46.5" at a rate of 1" per second. 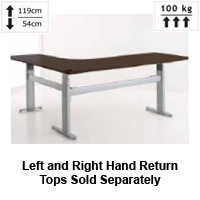 This base will support most smaller custom worksurfaces and several stock tabletops. It includes wheels at the back of the base for easy movement when required (the wheels also feature brake locks to prevent undesired movement during use). Available in powder coated silver or black. The 501-19 Series from Conset is the perfect balance of form and function for a single column electric workstation. 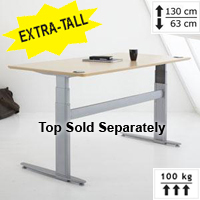 It is ideal for corner applications and will accommodate smaller tabletops with a total lift capacity of 220 lbs. The adjustment range is 26" to 46.5" at a rate of 1.1" per second. 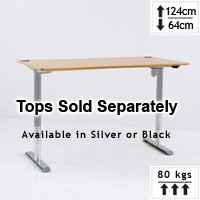 This base will support most smaller custom worksurfaces and several stock tabletops. 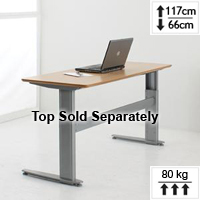 It is designed with stability and comfort in mind, offering more space under the desk for the feet of the user than the 501-7. If mobility is a requirement, an optional caster accessory and battery pack (for independent power supply) is available. Available powder coated in silver or black. The 501-29 bases will support a wide variety of work surfaces ranging in depth from a minimum of 26" to a maximum of 48". With five model widths available in silver, these frames can accommodate tops ranging in width from 33" to over 68". Need a table top? 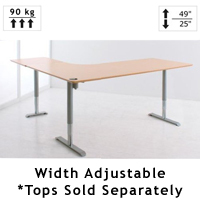 Consult our base/table top compatibility chart base/tabletop compatibility chart for recommended size options and then choose from our wide range of desk top options. The unit is 77.37" wide and will support a wide variety of stock work surfaces, and will also work with most custom tops. The entire base is powder coated in an attractive silver or black colour. The 501-49 Base from Conset brings elegant contemporary styling and improved flexibility to their line of sit/stand electric desk bases. A simple touch of a button will raise or lower the entire workstation - offering easy freedom to change working posture throughout the workday. The tubular leg design enables the removal of the usual lower traverse crossbar without any sacrifice in the stability of the frame. The result is a clean, contemporary, open design with nothing to interfere with leg movement. Black or silver frame colours are completed with chromed steel telescoping inner legs for a distinctive look. An expanding upper bracket permits 4" incremental width changes from a minimum of 45" to a maximum width of 69", making the 501-49 a very versatile desk frame. For those seeking a quieter unit, the 501-49 is substantially quieter than most other current Conset bases (i.e. 501-27, etc.). The new design also yields an increased upper range - permitting the frame to elevate from 25" to 49" at a rate of up to 1.26"/second. The lower range is slightly higher than other frames but at 25" is generally acceptable for all except the shortest of users. The 20" deep upper bracket supports make the 501-49 ideal for most desktops and lifting up to 176 lbs. It will not, however, work with tops shallower than a nominal 21" depth. 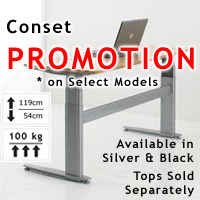 The 501-49 3-Leg Height Adjustable Base from Conset is designed for users who need an L-shaped desk and prefer no lower crossbars between the legs. Elegant and stylish in appearance, a simple touch of a button will raise or lower the entire workstation - offering easy freedom to change working posture throughout the workday. The distinctive tubular leg design enabled the removal of the usual lower traverse crossbar without any sacrifice in the stability of the frame. The result is a clean, contemporary, open design with nothing to interfere with leg movement. Black or silver frame colours are completed with chromed steel telescoping inner legs for a unique look. An expanding upper bracket permits 4" incremental width changes from a minimum of 45.6125" to a maximum width of 69.25" along the main bracket and 53" to 76.625", making the 501-49 versatile enough to accommodate a wide range of table top sizes. For those seeking a quieter unit, the 501-49 is also substantially quieter than most other current Conset bases (i.e. 501-27, etc.). This design also yields an increased upper range - permitting the frame to elevate from 24.75" to 48.375" at a rate of up to 1.26"/second. The lower range is slightly higher than other frames but at 24.75" is generally acceptable for all except the shortest of users. Suited for a wide range of table tops, the 20" deep upper bracket supports make the 501-49 ideal for most desktops and lifting up to 198 lbs. It will not, however, work with tops shallower than a nominal 21" depth. The 501-32 bases will support a wide variety of work surfaces ranging in depth from a minimum of 18" to a maximum of 48". (Note: mounting deeper 36" - 48" work surfaces requires the installation of the 501-32 Support Extender Accessory to ensure stability.) With five model widths available in silver, these frames can accommodate tops ranging in width from 33" to over 68". Need a table top? 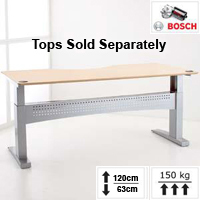 Consult our base/table top compatibility chart for recommended size options and then choose from our wide range of desk top options. Les piétements du 501-32 soutiennent une gamme de surfaces de travail de grande variétés avec profondeur variant de 18 po minimal à 48 po maximum. (Veuillez noter: l'assemblage des surfaces de travail plus profondes, c'est à dire, entre 36 po à 48 po, exige l'instalation de l'accessoire 501-32 Support Extender pour assurer la stabilité.) Avec des modèles de cinq largeurs différentes disponible en argenté, ces piétements peuvent recevoir des dessus de tables variants de largeur de 33 po jusqu'à plus que 68 po.